Excess Water Usage: Can You Help This Reader Save Water? You are here: Home / Environment / Excess Water Usage: Can You Help This Reader Save? My bill is closer to 70 koob (cubic meters) for a family of seven for 2 months! (33 at 4 NIS, 14 at 5.5, and 24 at 7.9! Will the 20 NIS a cubic meter fine go on the last group only or also on the 5.5 NIS group? :-( And are we being charged properly, or is the water authority pulling our plug?) and you said you use 26 for the two months of Pesach . . . I saw your post about getting rid of our Maytag, and peeked at your Purim mask [with more water-saving suggestions], but can someone show me a way to cut my usage by two-thirds???? Well, if you have 5 children you should be getting an extra 6 cubic meters a month at the lowest rate. I think that would put you at 36 cubic meters at the lowest rate of NIS 4. Otherwise the rate sounds similar to what I have paid until now, but I don’t have access to my water bill at the moment. Yes, you would pay the tax on the last 24 cubic meters. Another reader I know has a similar problem. She also has a Maytag From an email list I learned that some Maytags have different settings. A poster was complaining that her laundry came out full of lint, so another poster recommended a different setting that allows an extra rinse. This means filling up the drum a second time. So if you cut that out, that would be an easy way to save (but I don’t know about the linty clothes.) Are there other Maytag users out there having problems keeping within their limits? That the communal water usage isn’t the problem (tzricha meshutefet). That there is no leakage anywhere–just turn everything off and look at your meter. If it takes a while to get hot water, keep a bucket handy and use the water for your washing machine or toilet. The official Israeli website recommends some obvious simple things (fix leaks, turn the water off when you are brushing your teeth or lathering in the shower, take shorter showers, wash your car with a bucket, etc.). We took this a step further, and we have implemented some simple solutions that conserve A LOT of water (about 45% on our last bill), & allow us to continue to water our garden (although less than previously). This required an investment of about NIS 150, and about 10 minutes per day ongoing. We recycle the water from the bath/shower & the kitchen (you can also recycle the water from your washing machine in the same manner). We invested in 2 large garbage cans (one to hold clean water, and the second to hold soapy water), 8 pails (the simple plastic pails that are used in construction cost NIS 5 each), and a few natlot (plastic washing cups with handles, about NIS 3 each). When running a bath or shower, while the water is heating up, we put the nozzle into the garbage can for clean water, and the water is stored in the garbage can instead of going down the drain. Also, we do netillat yadayim (ritual hand washing) over the garbage can for clean water, so this is also saved. After the water heats up, plug the bathtub. After your bath/shower, use a pail to scoop up the soapy water into the garbage pail for soapy water. The clean water is used for watering the garden. The soapy water is used to fill the small pails. Two to three pails are put in each bathroom, with a natla per bathroom. Instead of flushing with clean water, we flush by pouring some of the soapy water with the natla into the toilet. In the kitchen, we keep a huge plastic salad bowl in the sink. All the clean water (e.g. from netillat yadayim, rinsing vegetables, rinsing plates in clean water, etc) goes into the salad bowl. This clean water also goes to the garden. (We generate about 2-3 buckets daily in the kitchen, and about 4-5 on shabbat). You can also save the water from the washing machine in the same way. I haven’t tried this yet. You can use a small pump (e.g. a drill pump) to pump out the water from the bathtub into the garbage can or directly to the garden. I find it easier to just use a pail and scoop it up. Admittedly, the soapy water in the toilet is a bit gross. Any suggestions how to make it less so? Maybe put one of those water colouring things in the toilet? And remember that it helps the Kinneret . . . If you know Dani please send him or her over this way. One of the best ways to save water is to get a good dishwasher (2 actually, one for besari and one for chalavi). A good dishwasher uses far less water to wash dishes than anyone handwashing them. You want the kind of dishwasher that doesn’t require prerinsing of the dishes (they usually have some sort of grinder to grind up the small bits of food before sending it down the drain). We have these kinds of dishwashers (well, out chalavi one is broken and needs to be replaced), and all we do is scrape the large debris off the plates into the trash can and place the plate into the dishwasher and they come out perfectly clean. Another suggestion I’ve heard is to put a timer on the shower faucet. Take 3 to 5 minutes with the water on and that’s it. For kids, sometimes you need a “forced” timer that shuts the water off and won’t turn on again for a while 🙂 When we were kids and were taking too long in the shower, my father would turn the main hot water valve off … the water became ice cold … and we exited the shower almost immediately! Finally, the old adage from the 70’s – “If it’s yellow, let it mellow. If it’s brown, flush it down”. And the best thing of all we can do is to daven to Hashem, do good deeds, and hope the drought ends soon. And perhaps the second best thing would be to cut back on agricultural use of water for the time being. Certainly for low-value/high-water crops. Mark , even if the drought ends soon we still have to conserve water. I agree about the dishwasher. We recently replaced our (American) 10 year old dishwasher with a new European one. Both machines are the same size but we literally can fit twice as many dishes in the new one. The obvious is to turn off the shower while you shampoo, soap up and use conditioner. I should add that we are a family of 7 with a large garden and use about 27 cubic meters of water. I thought you’re not supposed to reuse netilat yadayim water. It’s probably a good idea to go back to the old bucket way of washing dishes. The dirty dishes sit in a bucket of soapy water, and then the rinsing can be very fast. In girl scout sleepaway camp, we had two buckets. One with soapy and one for rinsing, and we didn’t get sick. Bare minimum of water. Some web sites state that soapy bath water can be used directly in the garden. During the drought of 1976, I spent two weeks in England with a host family and the mother woud use soapy water to water her plants; I don’t think they died. tesyaa – I thought you’re not supposed to reuse netilat yadayim water. Usually not, but bshaat dchak, I doubt any reasonable and responsible Rabbi would hesitate to render a psak that permits it. Do you know anything about the system your neighbors are installing and what it’s called? We’re setting up our Maytag to water our lawn. Mark, I hate to be picky, but I don’t know what shaas hadchak has to do with it. Netilas yadayim is not just an empty ritual and tum’ah and taharah have (I believe) more than just a metaphysical meaning. I know that when we are in a situation where we can’t wash, like on a hike or whatever, it is preferable to eat the bread without touching it, holding it with a napkin or foil. No water would be needed. Halachically, this approach might be better than reusing netilas yadayim water. Just saying. Tesyaa – there is a concept in Judaism of dispossing of things used for a mitzvah with a mitzvah. For example, burning your lulav with the chametch. Looking for Chametz with a candle made of havdallah drippings,etc… I can’t think of a bigger mitzvah than saving water. Meaning – way to go Mark. Ariela, did you even read what I wrote? IF it is halachically preferable to not touch the bread instead of washing, not using water at all, wouldn’t that be easier than collecting the water and finding a way to reuse it? Any adult or child above bar mitzvah age should not have difficulty doing this. Kids who have problems not touching the bread are probably still under bar mitzvah age and are receiving chinuch. Although I am not Israeli, I am sensitive to the need to save water. In 1981 I was a direct casualty of a major water shortage in New Jersey. I accidentally stepped in a bucket of water my parents were saving to reuse, fell and broke my arm. I was in a sling for 8 weeks. Personally, I dont think “Netilat Yadayim” should be high on the water shortage list. After we stop watering lawns in public parks (and private yards), and private swimming pools are outlawed in Ramat Aviv Gimmel, Herziliya, Kfar Shmaryahu and Herziliya, then I think we could start thinking about Netilat Yadayim. Mark,thanks for the helpful info about dishwashers. Newer appliances have more energy and water saving built in. Ariela, thanks for the info about bathwater. Most people I know don’t bother purifying it, I think. After all, think about what animals probably defecate in your garden. Batya, economical hand-washing can definitely compete with a dishwasher. Regarding the halachic discussion, I read somewhere that it’s okay to reuse netilat yadayim water for some things and not others. Jameel, are you going to treat the water first? Are you sure you’ll need that much water for your garden? Anyone no one is thinking of outlawing netilat yadayim, but pools maybe. We may as well save the water if we can as we are paying for it anyway. Well, Tesyaa, I understand why this is an emotional issue for you LOL. teseyaa – sorry I didn’t understand what you meant. Jameel – maybe we won’t solve the water crisis with small steps – but it is a fatastic opportunity for education. I agree about the private swimming pools. Jameel – Personally, I don’t think “Netilat Yadayim” should be high on the water shortage list. I agree. As you said, there are far larger uses of water that could be curtailed first. Truly, the first thing that ought to be curtailed is non-high-value agricultural uses. Actually, industrial usage is more of a problem. Agricultural water returns to the ground, perhaps with pesticides but still. The industrial water becomes sewage. Thank you mominisrael* for reposting this, it is helpful! BTW, Jameel and I know Dani, one of us will beat the other to alerting him. We don’t have a garden, so most of these solutions aren’t applicable. With all due respect to kvetching about Kfar Shmaryahu and global warming, I’m more interested in how to save 300 NIS a month in fines Ack! The story’s premise is exactly this! 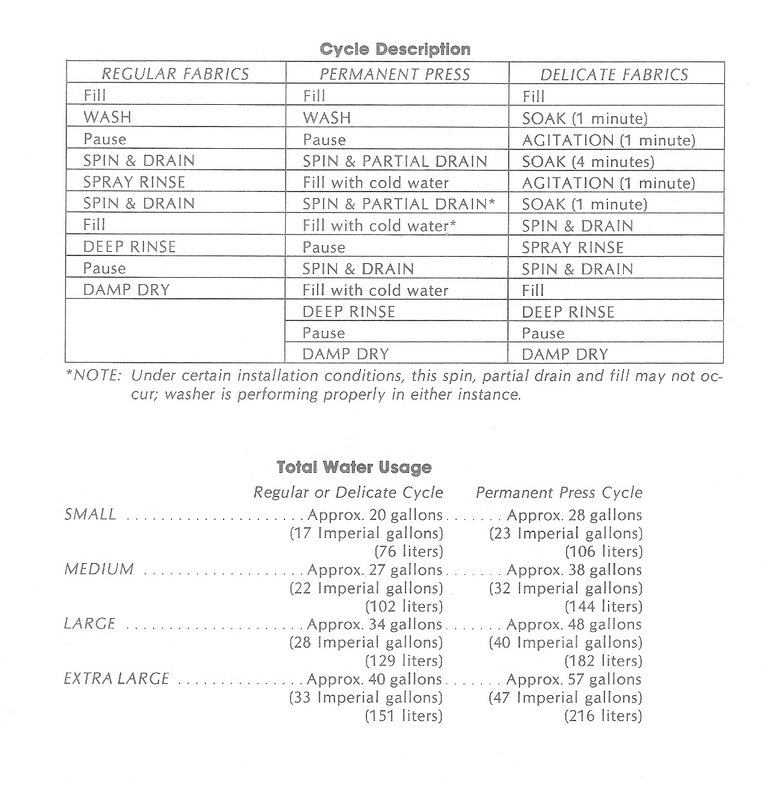 I’d still like to know if anyone with a Maytag manages to stay within the “normal” range of water usage. So far everyone I know who is struggling has one. Mrs. S., thanks for sharing that idea! Quite a bit of update on this one. I took a look at my bill, and noticed that this billing period was about 71, but last one was 56 and the previous 53, and all previous between 43 and 53. I called the water collection company (my local municipal Gviah) who suggested that I check for leaks – actually, to see if the water meter is spinning if everything is ostensibly off. And if it is spinning, I probably have a leak. If I would have a leak, the plumber should give a receipt, and I should send it to the water bill appeals committee (I kid you not) and I might get a refund! Well, all that is exactly what happened! I faxed then a letter with the gist of what I wrote here with the receipt, and today they called and said I would be getting a 120 NIS refund! (I think this is how much the 10 koob a month would cost at the lowest price). Whatever – the heightened awareness of noticing any movement on the tiny gear of my water meter (a full revolution is one liter, I think) and realizing that you can get money back that easily, and all these water saving tips, were all worth it. Bottom line – always submit plumber bills to the Gviah – what have you got to lose? Another thing – we sniffed around and found the papers for our Maytag A512 (year made unclear). We learned a little about the difference between permanent press, normal, and delicate, and small, medium, large, extra large. I have two questions that maybe you know the answers to. 1. The “16 cubes per person” that you mentioned, is that official? We are 5 in the family and they seem to be telling us that we should be using only 20 cubes for the family (including large garden and dog :-)) per 2 months (bill). >>16 koob per person is a typo. 4 koob per person sounds more right (16 koob per family of four). No matter what I do I can’t get it below 52 cube or so. Does that sound right? When I spoke to the “Gavia” they told me that 20 cubes was a lot and that we are using too much water. Never the less, after checking, it looks like others use about the same as we do – if not more. Is there something I can do? >>See the many ideas on those two blog posts I brought. >>To answer your last question, no:-) It’s a little known committee of appeals, that if they say no, who are you going to complain to? BTW, the repairs cost me more than the expected refund, and I still pay for either the keren or the knas of the excess water wasted. So I wouldn’t plan such a thing lechatchila. 1 the country should limit water to 2-5 days a week, like in Amman, for a month. This will get people angry, but will make most of them curb their use probably by at least 50%. Then, a la the story of the chassidim and the animals and the small house, when they bring back free water access, people will continue to use water frugally. 2 From all the workarounds that people talk about to gather water to reuse and reduce it, why aren’t houses built with secondary water tanks for used water to gather for a second use, and second use places automatically take from there. Gidon, thanks. I’m hoping to put up yet another post on this tomorrow.